I meant to publish this on Christmas Eve for anyone looking for a last minute craft, but I ended up leaving my camera at my in-laws and have been enjoying family time, so here it is now. 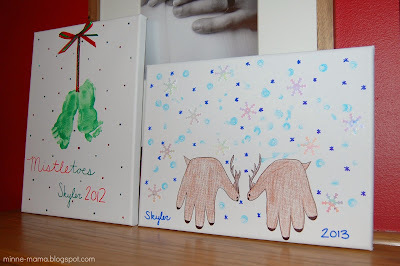 It isn't too late to make canvas art for this year. It would still capture the itty bitty hands or feet of your little one to admire next year. This would also be a great activity for any time of year, or to celebrate another special date, just pick a theme that would fit that date or time of year. 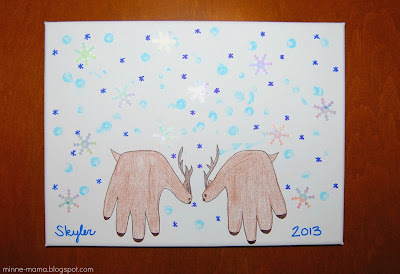 Last Christmas I wanted to make something with Skyler that we could use as part of our future holiday decorations. On Christmas Day, we ended up painting his tiny six month old feet and making "mistle-toes" on a canvas. I finished the canvas with some ribbon and glitter paint. I loved the finished product and it makes me so happy every time I see it on our mantle this year. I decided that it was going to be a tradition of ours to decorate a canvas (at least until we run out of space for any more). 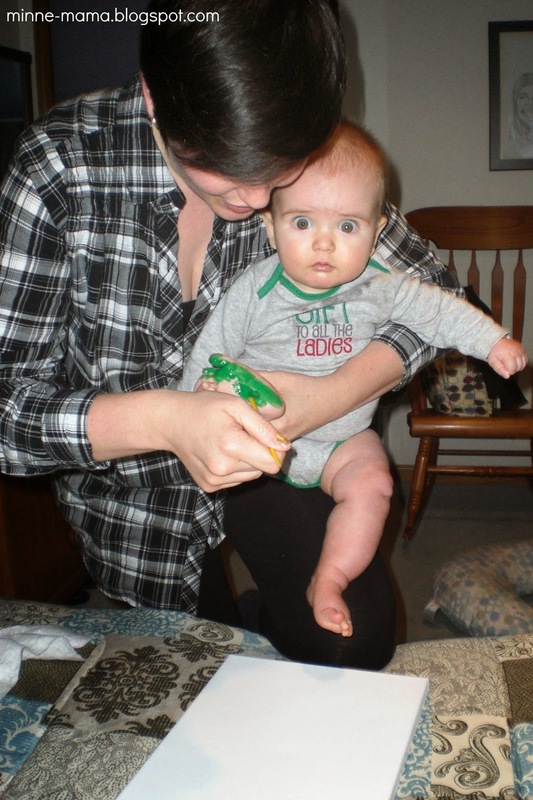 Skyler was thrilled with having his feet painted, as you can tell! 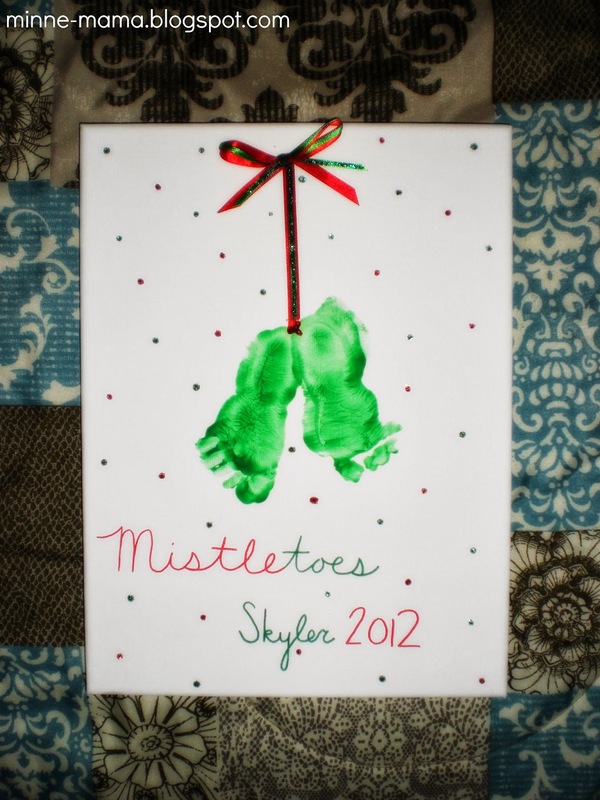 Since we did feet prints last year, we went with a hand print inspired canvas! I originally was going to do a wreath, but then we did the cut out wreaths for our door and window, so reindeer it was! I wanted to try something different with Skyler, so I attempted to trace his hands on the canvas, but he didn't love it, so I pulled him onto my lap and we traced them onto paper. It was easier for him to see, and then it was alright if we messed them up a bit. 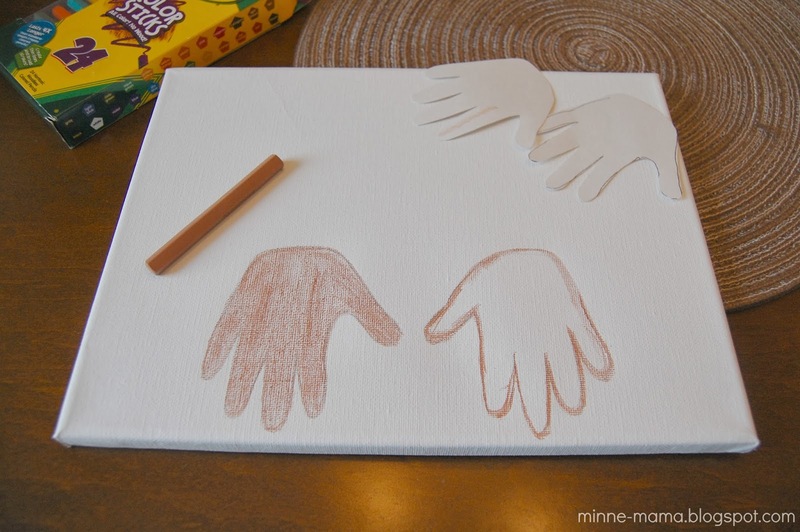 I traced the cut out hands onto the canvas lightly with pencil. Then I outlined and filled in the hands with a light brown colored pencil. I love the Color Sticks from Crayola for Skyler because they have no wood, so he can easily color with them and they come in a ton of colors. 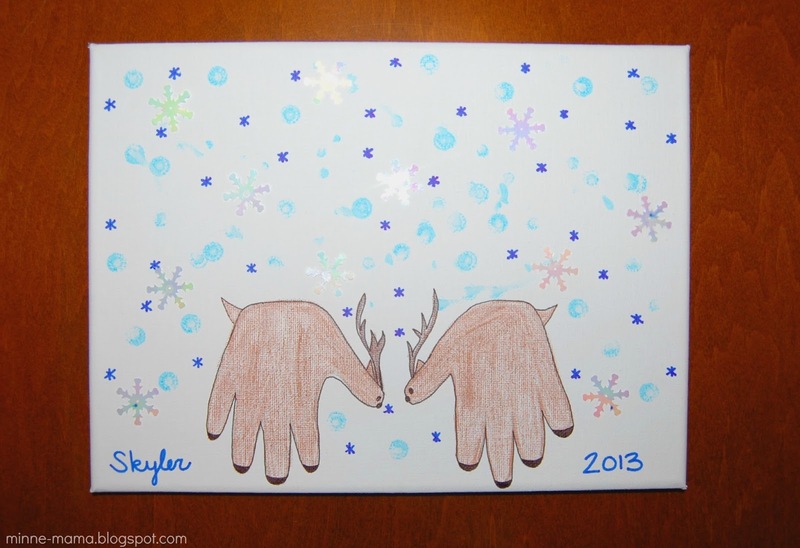 After coloring in the hands, I added some ears, tails and antlers. 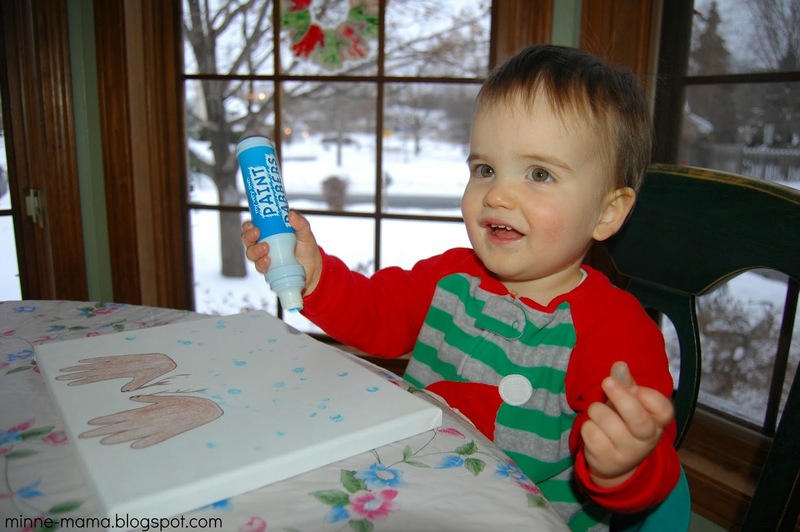 The next part of our canvas was to decorate the background. 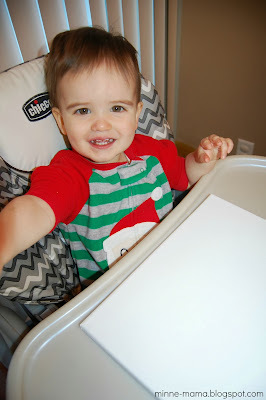 Skyler got to open a Christmas present a day early - paint dabbers! We have used them a lot at ECFE class and he has seemed to enjoy using them, so it was time to get him some of his own. Skyler used a blue dot marker to make snow falling from the sky. Then we added some snowflake sequins that I swiped out from our "snow" sensory bin. I wrote his name and the year and drew some small snowflakes in dark blue, since the sequins are not really visible from all angles, it added some extra snow to the sky. Here is our second annual multimedia canvas art. This activity has been fun to do with part of the work done by baby and part of the work done by mama, but in years to come, it will be even better to see Skyler creating his own masterpiece.